UMKC Jazz Night at the The Folly Theater – April 26, 2016! 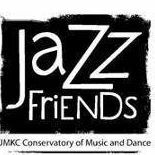 UMKC Jazz Friends Membership Party starts at 6:30p with complementary beer & wine reception, complete with food from Chris Miller Foods! Come join fellow jazz lovers and learn more about UMKC Jazz Friends. 7:30p Concert featuring Jazz Studies students from UMKC Conservatory of Music and Dance along with Bobby Watson and Dan Thomas. Tickets: $12 general public; $5 for UMKC faculty, staff, and all students with UMKC or student ID. This entry was posted in Event, Exposure, Jazz, Uncategorized. Bookmark the permalink.